Mrs. Anderson’s Children’s Wooden Rolling Pin is perfectly sized for smaller hands, baking with children, and aspiring young pastry chefs of tomorrow. Whether baking pies, rolling pizza dough, or learning how to make fresh pasta, Mrs. Anderson’s Children’s Rolling Pin fits smaller hands perfectly. It’s thoughtfully crafted from German beechwood with steel ball bearings for smooth and effortless rolling. A must-have of baking accessories and pastry tools, it’s perfect for rolling pie crusts, pizza crusts, cookie dough and other pastry dough, or rolling dough for biscuits and bread making, fondant for decorating cakes and cupcakes, and even rolling crafting clay. The wood barrel and wooden handles are made from solid hardwood then fitted with steel ball bearings for a lifetime of effortless use. Easy to clean, just wipe with a damp cloth. Dry promptly and thoroughly before storing. Brought to you by HIC Harold Import Co.
Mrs. Anderson's classic wooden rolling pin is a baking essentials must-have for home bakers, pastry chefs and professional chefs. 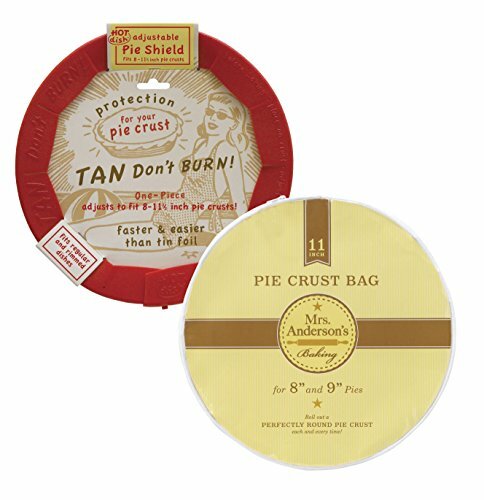 Whether learning how to make fresh pasta, baking pies, rolling pizza dough recipes, or creating healthy desserts, Mrs. Anderson's classic rolling pin performs the tasks of multiple baking accessories and pastry tools. Put it to work rolling dough for biscuits and bread making. 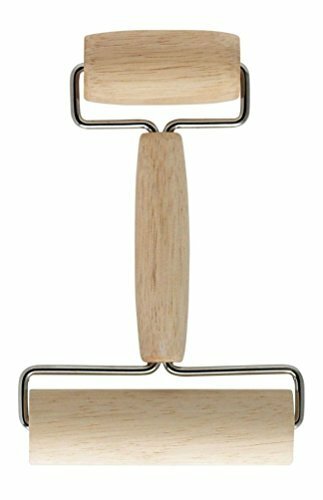 Or use it as a pastry roller for pie crusts, pizza crusts, cookie dough and other pastry dough. It makes a great fondant rolling pin when decorating cakes and cupcakes, too. Mrs. Anderson's classic rolling pin is proudly crafted in the USA. Its wood barrel and wooden handles are made from solid hardwood, which is responsibly harvested at the time of manufacturing. And, it's fitted with steel ball bearings for a lifetime of effortless rolling. Easy to clean, just wipe with a damp cloth. Dry promptly and thoroughly before storing. Brought to you by HIC Harold Import Co.
Mrs. Anderson's Baker's Rolling Pin has a handle-free design that provides exceptional control when rolling out dough. Made with German Beechwood and finished with all natural mineral oil. Pin measures 19-3/4 by 1-3/4-Inch. 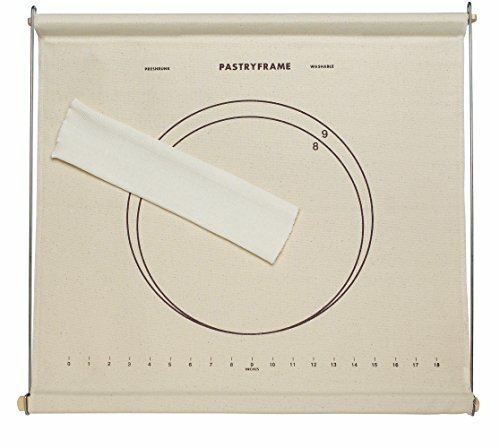 Description: Our half sheet size baking mat will turn your pan into a nonstick surface. ALIZ is especially great for working with sticky materials such as gooey dough, taffy, caramel, or anything your imagination allows. 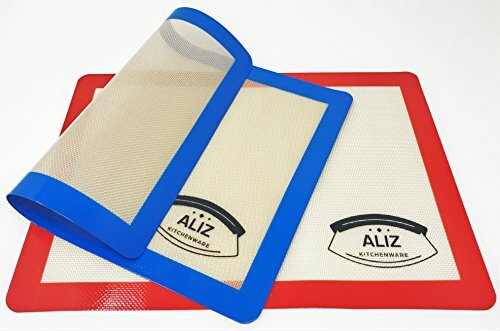 Nothing sticks to ALIZ Baking Mat, so it will save you a lot of time cleaning as there is no more sticky mess on your pans. ALIZ Baking Mat never needs greasing, which saves both time and money. Use ALIZ instead for any baking recipe that calls for parchment paper. Utilizing ALIZ products saves time, money and creates less waste for our environment. It is ideal for use when creating Danish pastries, baking biscuits, working with sugar and all sugary and salted preparations. ALIZ Nonstick Mats are made of fiberglass and silicone and can be used thousands of times. Life of product varies which lasts 2000 to 3000 uses depending on use and care. ALIZ products conform to US regulations on food grade silicone, and are FDA approved. Can be used at temperatures varying from negative 40 degrees C to 250 degrees C (negative 40 degrees F to 482 degrees F). Do not cut the ALIZ Baking Mat as the fiberglass mesh particles might migrate into the food. Fresh tape re-seals opened bags quickly and easily so foods stay fresher, longer. An easy bag sealer for everyone to use, even kids and people with arthritis. No more fumbling with awkward bag clips and chip clips! 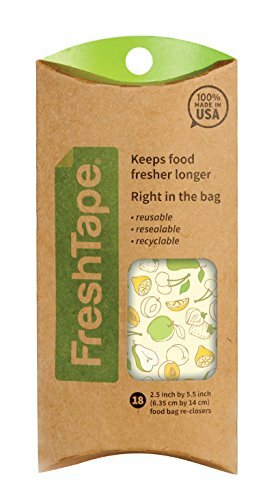 fresh tape is the stylish way to seal in freshness and reduce food waste. Each fresh tape is pre-cut and ready to use, and re-usable and re-sealable, up to 12 times. Seal bags of chips, cereal, salad, baby carrots, bread, rice and grains, dried legumes, and so much more! proudly made in the USA, fresh tape is economical, disposable and recyclable. Each pack comes with 18 pieces. Safe, Durable & High QualityWe are professional to offer the food grade silicone products. It is made of fiberglass mesh and the highest quality food grade silicone. The double thickness design is more durable and lays very flat and grips the counter top well. Folksy Super Kitchen mat has stood the test of time with use by the chefs.-- Highest Food Grade Silicone and BPA-FREE.-- Double Thickness Design(0.4MM)No need to worry the cookie cutters will damage the mat.-- Non-stick & Easy to clean,Dishwasher safeOur mats are great for working with sticky materials. It is much easy to roll out the dough, pie, pizza crust,brand,homemade biscuits and cookie dough.-- Non-slip & Lays FlatIt lays perfectly flat and won't curl around the edges. Mats are 26*17 inches and 0.4 MM thickness. It always keeps stable on the table. No need to worry the mat will move when rolling. 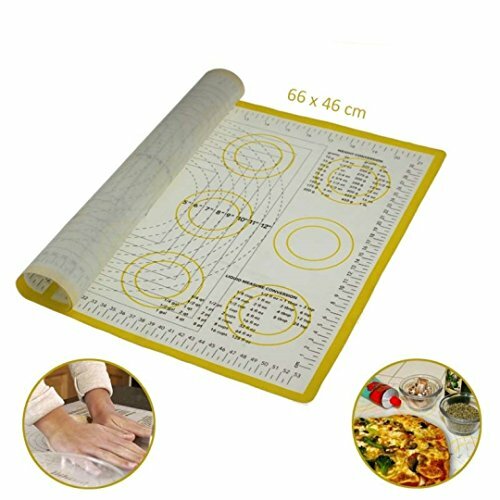 Mat is perfect to be pastry mat, counter mat, pizza mat, placement mat and kids mat and so on.-- Easy to storeThere is a hair-tie with this mat.It helps you to store this mat easily. 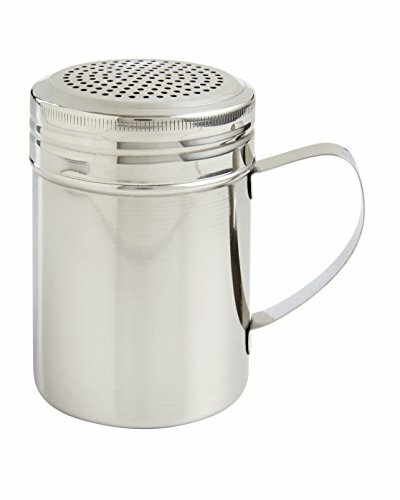 Compare prices on Mrs Anderson Rolling Pin at ShoppinGent.com – use promo codes and coupons for best offers and deals. Start smart buying with ShoppinGent.com right now and choose your golden price on every purchase.